A week after an aspiring strongman launched a surprise attack on the Libyan capital, an assortment of criminal gangs and extremists are rushing into the fight against him, raising new questions for the United States and other Western powers that have condemned his attack. A coalition of militias from around the region has stymied the assault by Gen. Khalifa Hifter, frustrating his predictions of an easy march into the capital, Tripoli, and forcing him to rely on long and circuitous supply lines through the desert to the south. By Friday his opponents were claiming that his tanks and armored vehicles were running out of fuel. But an increasingly unsavory cast has joined the coalition against him, including a group closely tied to a militia sanctioned as a terrorist organization by the United States and the United Nations; an extremist warlord sanctioned for undermining Libya’s stability; and other militia leaders sanctioned for migrant trafficking. That mix so alarms Western powers that some may deem General Hifter the lesser evil. His portrayal of his fight as a battle against extremists and criminals “becomes a self-fulfilling prophecy,” argued Frederic Wehrey, a scholar at the Carnegie Endowment for International Peace. Their emergence “gives Hifter and his supporters the narrative they want, so it plays into their hands,” Mr. Wehrey said Friday. The assault on Tripoli that began last week has threatened to plunge Libya back into full-scale civil war. United Nations officials said Friday that the week of fighting on the outskirts of the city had killed over 75 people, including seven civilians, and wounded more than 320. Over 9,000 people have been displaced from their homes or have fled the city, they said. Libya is one of the world’s largest oil producers, and the head of Libya’s national oil company said Friday that the fighting could “wipe out production.” World oil prices have already surged because of the fighting. General Hifter, who loosely controls much of eastern Libya, has vowed for years to seize the capital and unite the country, which has been divided since the overthrow of Col. Muammar el-Qaddafi in the Arab Spring uprising in 2011. Tripoli is the seat of an almost powerless unity government created by the United Nations and publicly backed by most Western governments, including the United States. Those governments have so far almost universally condemned General Hifter’s effort to take the capital. General Hifter has depended heavily on foreign backers — primarily the United Arab Emirates and Egypt but more recently on Russia and France, with at least tacit and possibly financial support from Saudi Arabia as well. Analysts said that chorus of condemnation would make it awkward for the United Arab Emirates and Egypt to intervene overtly to try to help him, as both countries have done in the past. But on Friday there were signs that the increasingly motley alliance of fighters defending Tripoli might be causing some in the West to hesitate about urging a retreat by the general. The power vacuum in Libya since Colonel el-Qaddafi’s ouster has allowed regional, Islamist and criminal militias to carve out patches of territory, including for a time a bastion of the Islamic State. The chaos has opened Libya’s borders to migrants and militants, periodically crippled its oil production and drained much of its sovereign wealth fund. Armed groups on both sides of the current fight for Tripoli have extensive records of abusing civilians, Human Rights Watch said in a statement. General Hifter’s forces have looted and burned homes, and carried out summary executions. One of his commanders, Mahmoud al-Werfalli, has been indicted by the International Criminal Court for war crimes. Other units in the general’s forces are dominated by Saudi-style ultraconservative Islamists who are hostile to democracy. The forces defending Tripoli, on the other hand, include four major militias that have ruled the city as a kind of mafia under the ostensible rule of the United Nations-backed government. At least one of them, the Special Deterrence Brigade, is also composed primarily of Saudi-style hard-line Islamists who oppose democracy and sometimes act as vigilante morality police. All four of the Tripoli militias have profited by extorting protection money from banks and government ministries, according to United Nations experts and an authoritative study by Wolfram Lacher of the German Institute for International and Security Affairs. 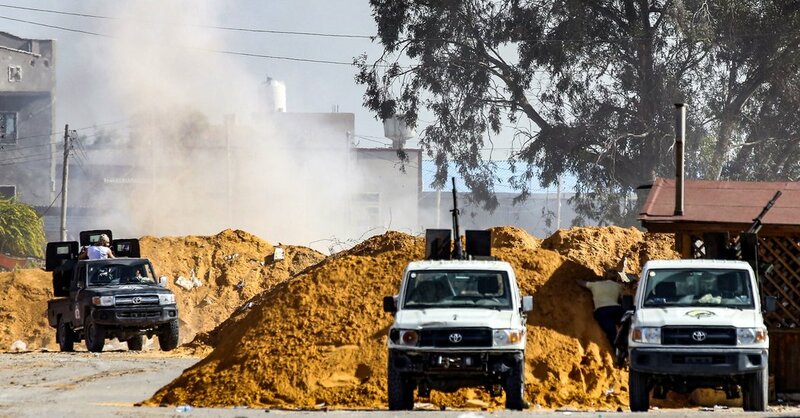 Those four brigades have been bolstered by the return of more potent militias from the nearby cities of Misurata and Zintan that led the fight to oust Colonel el-Qaddafi in 2011 and have remobilized to stop General Hifter. They were also joined by Salah Badi, a hard-line Islamist commander from Misurata who had all but receded from public life after he was sanctioned by the United Nations last year for repeatedly undermining Libya’s stability, including in the assault that destroyed the Tripoli International Airport in 2014. Alongside those forces are notorious migrant traffickers, including Abdul Rahman al-Milad, also sanctioned by the United Nations. Several hard-line Islamists previously based in the eastern city of Benghazi who had scattered after General Hifter took over the city in 2017 have also returned in Tripoli, talking openly about revenge against him. One of them, the Benghazi Defense Brigade, had included the militia designated by the United States as a terrorist organization after it played a role in the attack that killed Ambassador J. Christopher Stevens. The brigade’s leader, Mustapha al-Sharkasi, has compared the fight against General Hifter to the start of the uprising against Colonel el-Qaddafi in February and March 2011. “There is unity and the spirit of February is back,” he said in an online video. Mohamed Bayou, a former adviser to an earlier Islamist-allied coalition of militias that previously dominated Tripoli, said in a television interview that many of the fighters now battling General Hifter did not support the United Nations-backed government either. The dynamic in Tripoli in some ways resembles what happened when General Hifter first sought to control Benghazi in 2014. Some hard-line militant groups had been active in Benghazi before he arrived, but General Hifter’s attack on the city prompted other militias to embrace the extremists as partners. As the extremists grew in prominence, France sent teams of special forces with expertise in urban warfare to help advise him and by 2017 the French had finally helped him take over what was left of Benghazi.